Forum Index > Off-topic Talk > How do i make an Intergral belt suspention? Posted: Fri 28 Jul, 2006 10:37 am Post subject: How do i make an Intergral belt suspention? anyone out there made an intergral belt suspention? i think it looks really neat....but kinda detailed and complicated to make. any sugestions? or pictures you guys have? i may make that my next project. allso what period were these types of belts worn? and one more thing, what kind of belt did the vikings use? were they all baldrics or did some wrap around the waist? Curtosy of swordsmith Peter Johnsson. This is a common suspension method used from the 11th to the 13th centuries. This is a generalization as it may be seen a bit later and earlier, as well as being far from the only method used. However, this is the most common method found in modern replicas. Nordic suspension methods are something of a mystery as little concrete information has been found. It does seem that both baldrics and waist belts were used. Both were common in the migration period and may very well have carried over into the viking age. patrick has posted a great pic of a sword suspension. what time frame is your kit or sword? it can vary a little in later periods. Study this picture, it is the best reference out there, and contains some important info that isn't necessarily obvious from looking at pictures of complete scabbards, like where the straps go through the scabbard covering as well as the belts. 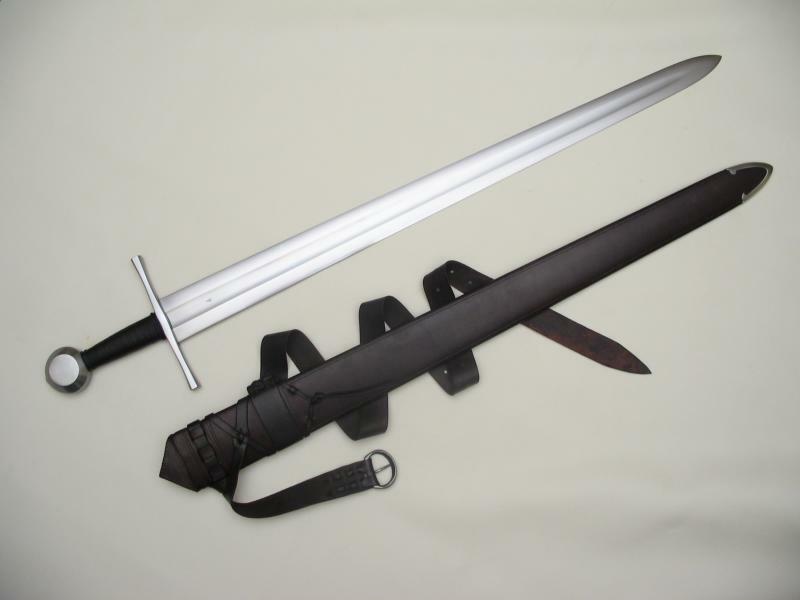 As far as I'm aware (though people more expert than myself my correct me here) integral laced-belt scabbards are good for 11th - very early 14th. Suspensions went through a lot of very rapid change starting in the early 14th century, moving from the kind of laced suspension depicted in Peter's picture to slightly different methods of attaching the belts, to lockets, to some kind of magic way of attaching scabbards to plaque belts (my theory is it's the same mystical force that stops the plaque belt sliding off the wearer ). Military effigies and brasses are a great place to look for this information. The webpage of Margrete's free lances has a bunch of effigies, sorted chronologically, which is quite handy. http://www.lanser.dk/. Here are a couple of pictures I put together for the "how to make a scabbard" webpage I'm working on. I'll get it done one of these days! They lack the artistry of Peter's drawing but might be a little easier to follow. There is a variation of this suspension which has the top belt splitting into three tails, but I haven't got pictures of that one, sorry. There are two separate belts, a grey one marked "A" at the top which splits to two straps, "B" red and "C" blue, and a green one marked "D" lower down. The colors are of course just for clarity in the diagram. 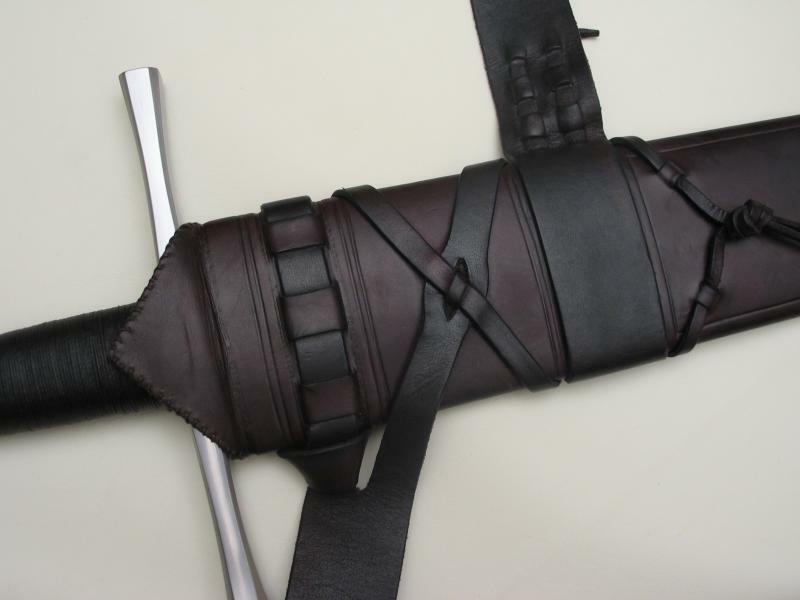 Belt A splits at point 1 into straps B and C, which do the work of holding both belts A and D onto the scabbard. Strap B wraps around the top of the scabbard, through itself and back around to the front where it is one part of the cross. Something which is incorrect in those pictures is that it shows strap B going straight across the back of the scabbard. In reality it goes across at a slight downward angle. Strap C goes from the split at point 1 in A straight across the front of the scabbard. At point 3 there is a split in strap C through which a small loop of the scabbard covering leather is pulled up and has strap B threaded through it. This locks both straps to the front of the scabbard. 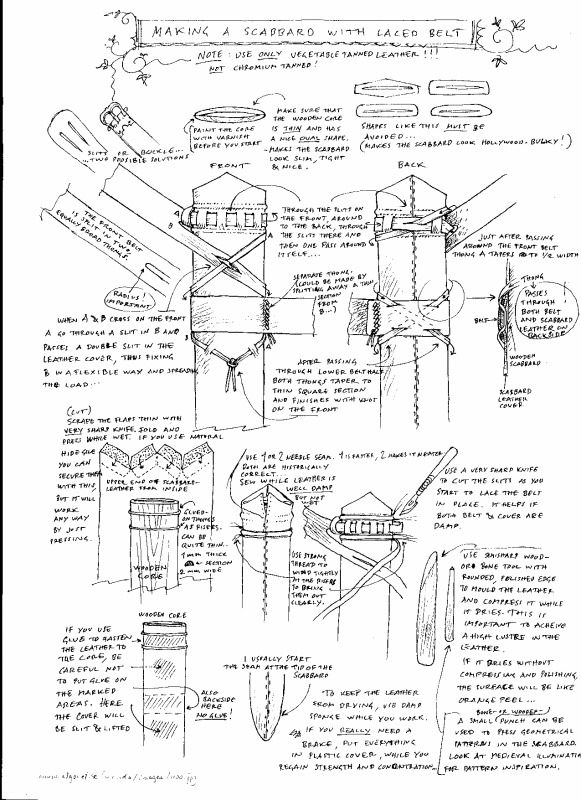 After crossing over the front at point 3, straps B and C wrap around the back of the scabbard and cross at point 8. The thing to note here is that they thread through both belt D and the scabbard covering leather, which is what stops belt D from sliding up and down the scabbard. 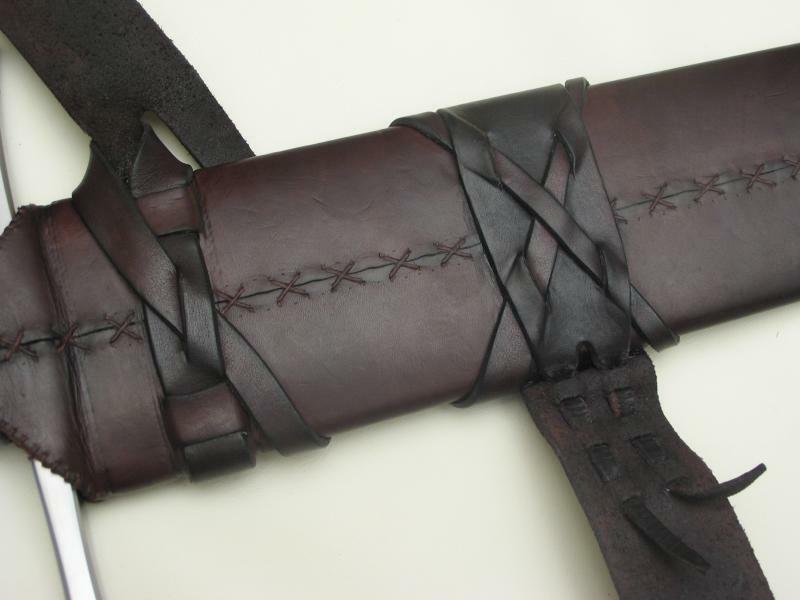 Belt D just wraps around the scabbard and is fixed back to itself. Either by sewing it together, or by cutting it into tapered tails and threading those tightly through slits in the belt. After crossing at the back under belt D, straps B and C wrap back around the front of the scabbard and through loops cut in the scabbard covering at point 4 and are then tied together with a square knot. This isn't a particularly difficult suspension to build, and is a lot of fun. The key is to take it really slowly, lay everything out and very carefully mark where you are going to make the cuts in the scabbard covering. I split belt A and wrapped untapered straps B and C around the scabbard in the positions they were going to be in so I could work out how long to make them. B needs to be a fair bit longer than C. Once I'd worked out the lengths I tapered them both and threaded them onto the scabbard. I cut the slits in the scabbard covering as I went, making them very slightly smaller than they needed to be so the scabbard covering leather would stretch slightly and give a tight fit. Once I'd worked out where everything was going to go the single hardest bit was getting the straps threaded through the back of belt D at point 8. I did this in the end by attaching a length of heavy thread to them with a big needle and using that to pull them through. If I were doing this again I'd stitch a thin metal or plastic leader onto the tip of each strap and use that to guide them through. I just trimmed the ends of the straps to the same length [b]after[/a] I'd tied the square knot. Here's a couple of photos of Peters work. Is that scabbard for the Knight, the Big Johnsson, or some other sword?